Obituary – Groom, Linda Sue (Fansler) « Perry High School Alumni Association, Inc. Pep Club 10, 11; GRA 10; Prom Committee 11. Linda Sue Groom, 34, route 2, Perry, died on December 17, 1986 at the home. 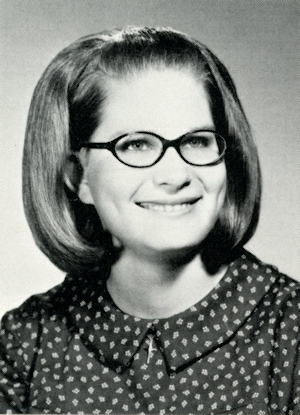 She was the daughter of Everett and Linda Fansler and was born at Ponca City, April 15, 1952. She came to the local area with her family in 1962 and was a 1970 graduate of Perry high school. She and Sid Groom were married in 1970 at Perry. A former beauty operator and former real estate broker for Bird Realty, Mrs. Groom was a student at Northern Oklahoma college. She and her husband farmed southwest of Perry and operated G&O Oil Properties. Mrs. Groom was a member of the First United Methodist church and the Perry Elkettes. Painting was a hobby of Mrs. Groom. In addition to her husband, of the home, survivors include one son, Wade Max Groom, and a daughter, Amy Beth Groom, both of the home; her parents, Mr. and Mrs. Everett Fansler, Perry; two sisters, Dorothy McLaughlin, Perry, and Debra Bowman, Pawnee; and her grandmother, Dorothy Brag, Ponca City.